LAHAV – For The Premature Babies In Israel (Tel Aviv, October 2018). When we drew Israel in the newly formed Nations cup, it was considered a challenge to find a children’s charity which would not be associated with religion, politics or government funding. However, with some assistance from The Sunshine Appeal’s great friend and supporter, Davy Provan – a resident of Cyprus – we identified the excellent charity Lahav, which is a nationwide non profit making charity supporting premature babies and their families. 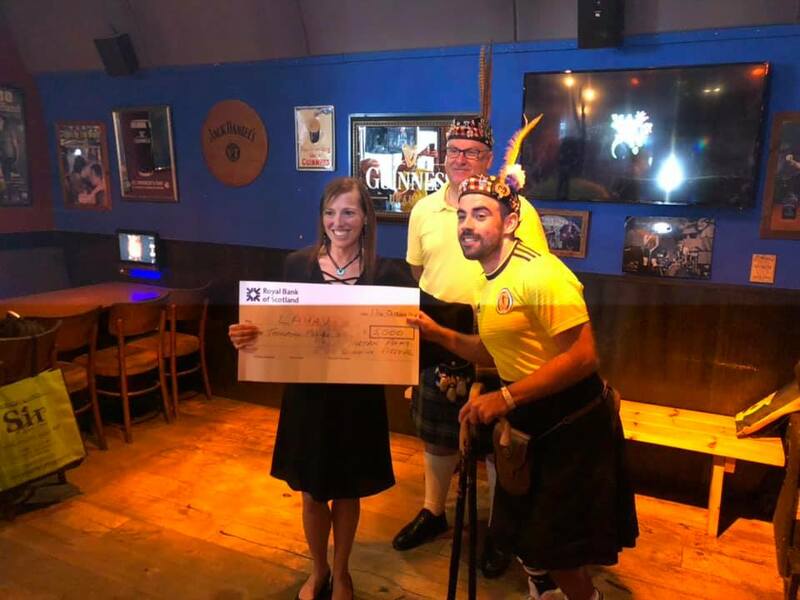 As most of the Tartan Army were based in Tel Aviv prior to the match in Haifa, it was decided to arrange the presentation in Tel Aviv on the morning of the match. It took place in a local hostelry, which most TA adopted as their place of residence throughout their stay in Israel: Mikes Place. We met with representatives of the charity on the morning of the match at 11am where they showed an emotional video to all present on how their work impacts on the lives of premature babies. It had many hardened TA footsoldiers close to tears. We were aware one of our very own footsoldiers, Alan Gray (“slowfootsoldier”), had been a premature baby. This has left him with many problems of his own, and since it was a cause very close to his heart, we invited Alan to make the cheque presentation to Romi from Lahav. Our thanks go to Alan for his involvement on the day. We all know what happened later that evening in Haifa, and we will not dwell on the match and result, but we have recently been updated from Lahav, telling us that since we made the Presentation to them, which was featured on National media, their profile has been raised considerably with the public of Israel, and many other donations have now been made locally. Giving a charity some National exposure has always been one of the important roles played by the Sunshine Appeal. LAHAV is a nationwide organization established by parents of preterm infants and premature babies for the purpose of promoting and improving the conditions for premature babies and their families in Israel, to try and reduce the number of premature births born each year and increase awareness of the dangers that lie ahead. Premature babies occur 3 times more in Israel than in other western countries and they are fighting as a charity to help improve medical facilities with donations of equipment and also with support for families. They are a not for profit organisation and this is their website – we suggest you use Google Chrome to read the pages as it’s in Hebrew. They will use any donation to provide medical service for babies in need for those that are not covered by governmental insurance and also help provide equipment for the premature nurseries.